A few weeks ago I blogged on New Zealand’s famous bar-tailed godwits and their annual migration from our estuaries to their breeding grounds further north, however a recent unexpected encounter reminded me of a record-breaking bird that makes the godwit’s journey look like a stroll to the local dairy. Now we’ve all had that sinking feeling when you’re late for a first date; the car won’t start, the bus doesn’t arrive, or you get three blocks down the street and think ‘did I leave the stove on?’, but whatever the reason, the Arctic Tern I saw at the Ashley River recently will be disappointing his date big time. 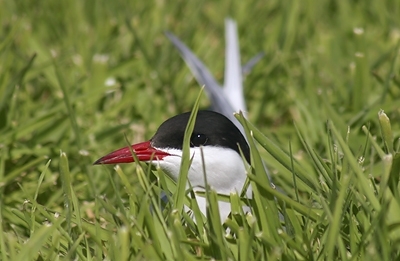 As their name suggests, the Arctic Tern spends much of the year close to the Arctic circle, breeding in noisy summer colonies on offshore islands around the UK and northern Europe, where they are well-known for offering a free scalping service to conservation researchers or day-trippers. However, as soon as three months after fledging these ‘sea swallows’ embark on an un-paralleled trip from their Arctic seabird cities to that other well-known block of ice down-under, Antarctica. 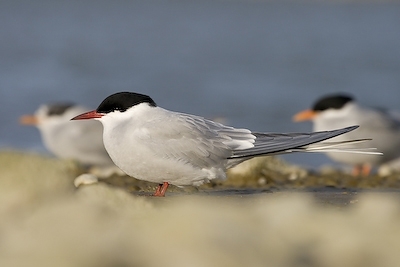 This annual round-trip of nearly 40,000kms is considered to be the longest known migration of any animal on earth, and it is on the Southern leg of this journey that Arctic Terns are occasionally seen in New Zealand waters. Spending much of the Southern summer at sea means sightings of these globe-trotting terns are rare, so you can imagine my surprise when whilst happily photographing Black-fronted Terns at the Ashley Estuary recently, an Arctic Tern walked into my viewfinder. Even more intriguing to bird experts who confirmed my find was that the Arctic Tern was in full northern summer plumage, suggesting he should have been chatting-up other terns on a small Scottish island weeks ago. So whatever the reasons, this particular Arctic Tern decided to hang around with the Canterbury locals, before contemplating the epic journey ahead of him. The only question is, will he be the last one standing at the bar when he finally arrives?